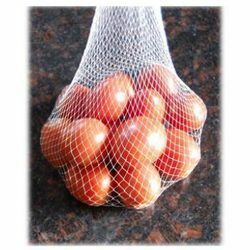 Our range of products include vegetable packaging nets. By keeping track of the latest industry developments, we are offering a premium quality Vegetable Packaging Nets. The offered packaging net is used for packaging of potatoes, tomatoes, toys, balls and as a promo pack. Also, this packaging net is capable of fitting in any shape to ensure easy and safe transport of the various items. We offer this packaging net in various sizes & customized options in order to meet various requirements of customers. Looking for Vegetable Packaging Nets ?